Samuel J. Stone (1839-1900) wrote this hymn as one of twelve published in Lyra Fidelium: Twelve Hymns on the Twelve Articles of the Apostles’ Creed (1866). At the time of its publication, Stone was a young priest at New Windsor Parish Church, a poor district at Lavington, Oxford, in England. Earlier, during his education at Charterhouse (1853-1858), he won a prize for composition in English verse. He continued his education at Pembroke College, Oxford (1859-1862), leading to his ordination as a deacon in 1862 and as an Anglican priest in 1863. Controversy over critical biblical methodologies was heating up. Interestingly enough, the theological battle over the nature of the Bible was waged not on the island of Great Britain, but by two bishops serving in South Africa. One of Stone’s hymns was composed in support of the conservative stance promoted by the Bishop of Cape Town, Robert Gray (1809-1872). Gray defended the traditional dating and authorship of the Pentateuch. An adversarial position was advocated by his popular colleague Bishop John William Colenso (1814-1883) of Natal, South Africa. 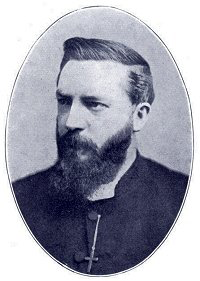 Colenso was the author of several scriptural commentaries including The Pentateuch and Book of Joshua, Critically Acclaimed (1866) that espoused source-criticism, an emerging scholarly method of biblical criticism for dating and establishing the authorship of Scripture. Following closely on Colenso’s work was the appearance of the documentary hypothesis (known by the acronym JEPD) in a seminal text by German scholar Julius Wellhausen (1844-1918), who, drawing upon the work of others, published Geschichte Israels. Bd. 1 (“History of Israel, Vol. 1”) in 1878. These were heady days that shifted the tectonic plates of biblical understanding. The animosity between these two South African bishops resulted in an unsuccessful attempt by Bishop Gray to remove Bishop Colenso from his post and have him excommunicated. “The Church’s One Foundation” speaks specifically to article nine of the Apostles’ Creed, “(I believe in) the Holy Catholic Church: The Communion of Saints.” The hymn itself is based on I Corinthians 3:11: “For other foundation can no man lay than that is laid, which is Jesus Christ” (KJV). This hymn, as well as others in the collection, was intended to serve pastoral, devotional, and catechetic purposes, according to hymnologist Albert Bailey, aiding in the “interpret[ation of] the Apostles’ Creed for the benefit of certain cottagers in his Windsor suburb who were accustomed to repeat it as one of their private prayers” (Bailey, 1952, 377). What I can’t understand I won’t believe. Where did I come from then? Ah! Where indeed? That is a riddle monstrous hard to read. The church exists in a constant state of controversy and potential schism. In many ways, this text articulates feelings that are as fresh as ever. British hymnology scholar H. E. C. Stapleton offers insight into the hymn’s popularity: “The strength of the hymn lies in the simplicity and directness of its message, the vividness of its metaphor, and the deliberate and distinct echoes of words and phrases from Scripture. In Lyra Fidelium there are no less than four biblical quotations annotated to each verse; in one, seven. It was hailed in Stone's own time as ‘the battle-song of the Church’” (Stapleton, “The Church’s One Foundation”). More than twenty years later in 1888, the popularity and influence of the hymn was manifest at the Lambeth Conference, assemblies of the bishops of the Anglican Church held every ten years and convened by the Archbishop of Canterbury. Accounts indicate that it was sung with vigor at all of the major services of the Conference. Australian hymnologist Wesley Milgate records the effect of the hymn on those who sang it in A Companion to Together in Song: “Sung by a large congregation, some people say this hymn was really more than they could bear. It made them feel weak at the knees, their legs trembled, and they really felt as though they were going to collapse” (Milgate, 2006, 335). For those concerned that a hymn might be written for the purpose of advocating one theological position over another – what some might call “propaganda” – there is significant historical precedent for the use of hymns in this manner. Except perhaps for hymns that cite Scripture exactly, all hymns promote the author’s experience and perspective in some way. It is up to the broader church to either validate or ignore that perspective in its choice to place a hymn in a collection and “to sing or not to sing” the hymn in worship. Bailey, Albert E. The Gospel in Hymns. New York: Charles Scribner, 1952. Milgate, Wesley and D’Arcy Wood. A Companion to Together in Song. Sydney: Australian Hymnbook Pty Ltd, 2006. C. Michael Hawn is University Distinguished Professor Emeritus, Perkins School of Theology, Southern Methodist University.